The history of art is fascinating. Unfortunately in times gone by teachers somehow made it seem dull and boring. However if you look at the amazing stories of ambition, investigation, experimentation, triumph, betrayal and intrigue that accompany the History of Art you will be enthralled. Does this sound like an exaggeration? 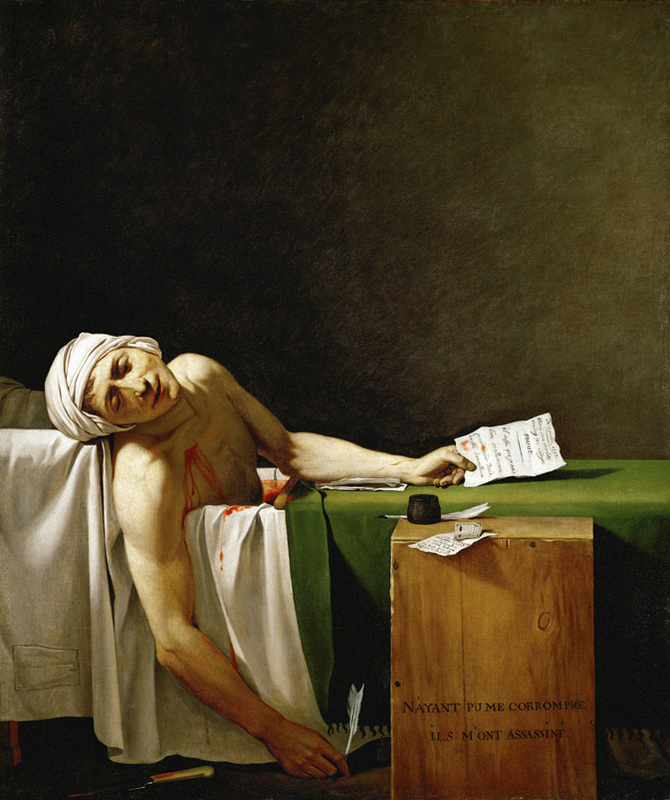 Marat’s assassination led to his apotheosis. In art, this term refers to the treatment of any subject in a particularly grand or exalted manner. The painter Jacques-Louis David was asked to organize a grand funeral for the dead hero. It is a strange story of intrigue, and the painter stands condemned today for having glorified a man who was implicated in ordering and designing the death of many people. Such are the intricacies of revolutions, rebellions uprisings and the lie. The painting is dramatically staged and has a photo real quality. It captures one version of a moment in time, during a revolution when secrets were being told, and lives were being lost through betrayal. Also, this is one of the most realistic and accurate times in the history of art. Today the camera has superseded this kind of “headline capture” for newspapers, which blurt out shocking and horrifying stories of war and disaster. In those days, the same kind of painting also captured moments of triumph, such as weddings coronations, electoral wins and the winning of wars. The real battle of the Modern and Post-Modern art world has been the battle not only to keep up with change and the complexity of our times with innovations such as digital art and graphics, Transmedia and Manga, performance and installation art and much, much more. This journey from the old fashioned, functional use of art as a camera and a journal, through the functionalist period of the Bauhaus where art was fashioned to carry function both in an economic sense and in a reductive sense wherein all things became simplified, has led us to the modern forms of Art we know today. The accepted mores of the art world do not change easily, and as the art world moves from period to period, friendships are lost, and the scene is thwart with battles, betrayals and intrigue and the rampage of bullies. Think of Kristallnacht and the exile of Jewish artist. Think also of the rampages in Mussolini’s Italy before the Second World War. Always, as with everything, the cream of any era rises to the top. What represents the best of the offerings of the times, is the art that has been housed and treasured in galleries and museums around the world. In an age where indigenous cultures are threatened, and their languages are thought to be becoming extinct indigenous arts from across the world are being seen with fresh eyes. The artwork of Lena Nyadbi now now able to be seen as an installation from French roof tops, and from the Eiffel Tower, attests to the recognition the Indigenous Arts are gaining worldwide. Art now performs a health oriented function in todays society. It always performed as a kind of lubricant for health and well being throughout the world. Art in recent times has rarely been seen in this light. Art has the capacity to transverse and to transcend not only cultural barriers, but the sorrows, the hardships and the resultant ravages of mind caused by revolutions, wars and disasters alluded to above. The Grand Master – Marc Chagall was an exquisite painter of the 20th Century, who survived the concentration camps of Russia, and who then escaped many times from various Fascist places while remaining to his chosen career as an artist. He produced a transcendent form of art that attests to the human spirt of survival. He survived to become one of the most mature and overtly healed human minds of the times. There are of course so many other periods and other cultures that can be explored. That is what Art History is – an exploration of the Art of cultures and the times in which the art was produced. As a student, you bring to the Art History Class your own perspective. You bring knowledge of your own culture to share, or to explore if you don’t know much about it. If you share liberally, the other students who have come to the class for the same purpose you have, do also a learning community will evolve and much will be gained. To share, to investigate, to learn, to experience and to create, by mixing looking at the ideas function and meanings of Art throughout time, this is what Art History is about. Don’t forget to bring an open mind! Jacques-Louis David (17930) Oil on Canvas. 165 cm × 128 cm (65 in × 50 in) Royal Museums of Fine Arts of Belgium. Creative Commons. This entry was posted in artists, style treatment and tagged classical painters, grand narrative, Jacques Louis David, marat, painting analysis, style on August 30, 2013 by Jo Murphy.